Shanghai Disneyland is the sixth iteration of Walt Disney's original Disneyland theme park. If you’ve been to one or more of the five other parks in the U.S., Asia, or Paris, you might wonder whether you would want to plan a visit to the mainland China Disneyland. Would the experience be unique and compelling enough to warrant the expense and effort, especially if you would have to travel a great distance? You would undoubtedly be highly impressed by many things about Shanghai Disneyland, especially its look, feel, and presentation (and a couple of incredibly cool new rides—more on that in a moment). It is utterly unlike any of the other Disneyland parks. That is by design. Chairman and CEO Bob Iger’s clarion call to his merry band of Imagineers was that Shanghai Disneyland should be “authentically Disney and distinctly Chinese.” Mission accomplished. For a more in-depth answer as to whether you might want to consider meeting Mickey Mouse in Shanghai, let’s run down the ten top reasons to plan a visit. Note that the following items are not necessarily the best things to do and see at the park and resort (although many of them would surely make any top-ten list). For example, among the park’s premier attractions are Soaring Over the Horizon and Roaring Rapids, neither of which are on this rundown. The former is virtually identical to the Soarin' attractions found at the U.S. parks, and the latter, while it incorporates great theming and effects, is essentially similar to other river raft rides—including Kali River Rapids at Disney's Animal Kingdom. What follows are some of the truly unique characteristics of the China park. Indeed, these are the most compelling reasons why even seasoned Disney park fans might want to make their way to Shanghai Disneyland. The sheer scale and appearance of the show building, which dominates the Tomorrowland skyline, is majestic. After the sun sets, the changing colors of the curved wave canopy is mesmerizing as trainloads of lightcyles periodically blast outside and perform graceful arcs around the structure. The themeing is stunningly vivid and includes some entrancing elements. Riders, quite convincingly, become “Programs” (in Tron parlance), at least for a few glorious moments. It’s not among the world's fastest roller coasters. (Although its launch certainly feels turbo-charged and is quite zippy compared to Disney's other coasters). Tron Lightcycle Power Run, however, is a masterful blend of exhilarating thrills and absorbing storytelling. It alone just might be worth the price of admission to Shanghai Disneyland and enough of a reason to pack your bags for a trek to the park. But, here's some wild news for those of you in the States: Soon you won’t have to pack your bags and make your way to China to ride the Tron coaster. That’s because Disney announced it would be building a second Tron coaster at the Magic Kingdom in Walt Disney World. Read our review of Tron Lightcycle Power Run. Then again, Shanghai Disneyland's version of Pirates of the Caribbean, subtitled Battle for the Sunken Treasure, could also, on its own, make a strong case for a visit. These are not your father’s yo ho-ing Pirates. The attraction is based on the wildly popular film franchise (which, in turn, is based on the original ride—Pirates may be the ultimate meta intellectual property) and prominently features Johnny Depp’s Captain Jack Sparrow along with other cinematic scalawags. Instead of the cocktail party-style concept of its predecessor, in which boatloads of passengers randomly eavesdrop on the pirately proceedings, the Shanghai ride tells a linear story. And yo, it tells its story in grand style. The attraction is crammed with a treasure chest of things to see and experience, including a few jaw-dropping highlights. Innovative boat ride vehicles, powered by an underwater magnetic motor system, help keep passengers focused on the action and are integral to the storytelling. Battle for the Sunken Treasure incorporates the kind of large-screen media immersion that Universal has used to such great effect in attractions such as Harry Potter and the Escape From Gringotts and Transformers: The Ride 3D. But it also includes plenty of the dark ride elements that Disney pioneered, including practical sets, 4D effects, and audio-animatronic characters. (Treasure’s talking robots just may be the Imagineers’ most stunning yet.) The combination of new- and old-school E-Ticket techniques helps make Shanghai Disneyland’s Pirates one of the world's greatest theme park rides. Read our review of Pirates of the Caribbean Battle for the Sunken Treasure. Every Disneyland park offers a castle. The largest and most elaborate one to date, Shanghai’s palace offers opportunities to explore its ornate chambers and turrets. Rather than being tied to any one princess, the Enchanted Storybook Castle pays homage to many of Disney's heroines. Guests can also travel through the castle's caverns aboard Jungle Cruise-style boats in Voyage to the Crystal Grotto. First, riders pass a series of outdoor, fountain-enhanced scenes from films such as Mulan, Fantasia, and Beauty and the Beast. Then they enter the castle's darkened grotto where stories springs to life using projection mapping and other effects. In addition to the two attractions, the enormous castle is a hubbub of other activity. A permanent stage set up in front of it is used for musical shows featuring the princesses. The park’s only full-service restaurant, the Royal Banquet Hall, is located on an upper floor. At its base is a Bibbidi Bobbidi Boutique makeover salon (you have to love Disney’s Mandarin translation of the shop as “Colorful Magical Fanciful Transformation”). Guests walking through the castle can ogle the mosaic tile renderings, the stained glass windows, the chandelier, and other features of its high-ceilinged rotunda. As you'd imagine, the striking facade also serves as a centerpiece for nightly fireworks and image mapping shows. Among the live shows at the park is “Tarzan: Call of the Jungle.” Heeding the “distinctly Chinese” mandate, Chinese acrobats retell the boy-raised-by-apes tale in a spectacle that features impressive displays of agility. “Eye of the Storm: Captain Jack’s Stunt Spectacular,” is presented in a tricked-out theater and includes swordplay, copious amounts of Jack Sparrow attitude (which is evident even if you don’t understand a lick of his Mandarin dialogue), and a finale that quite literally blows audiences away. For a separate admission, you could see the complete Broadway production of “The Lion King” presented in Mandarin. It is staged in a lovely theater located in Disneytown, the resort’s shopping, dining, and entertainment complex. By the way, “Hakuna Matata” apparently needs no translation in any language. The beloved Peter Pan’s Flight is a classic C-Ticket ride that dates back to the original Disneyland’s opening day. In Shanghai, Imagineers have expanded and updated it with additional scenes, larger ride vehicles (which still use an overhead track system to simulate flying above London and off to Neverland), new digital image mapping and other media effects, and other enhancements. Reimagined and plussed up as a D-Ticket ride, it is even more charming than its predecessors. Yes, you could chow down on popcorn, churros, corndogs, Mickey ice cream bars, and even turkey legs (although you’ll have to hunt down some of the States-based items to find the few locations that serve them). But 70% of the food served at Shanghai Disneyland is, well, distinctly Chinese. Among the more lovely eateries is the Wandering Moon Teahouse (pictured). You might want to savor its Wagyu beef noodle soup which is adorned with a brown egg that has been boiled in tea. At the Tangled Tree Tavern, you could enjoy a rice dish with unidentifiable (to non-natives, anyway) mushrooms and other items. For a Westerner open to a bit of culinary adventure, there is plenty of exotic, delicious fare to sample. Another standout eatery is Barbossa’s Bounty. Offering tasty BBQ, seafood, and other items, one of its dining rooms is adjacent to the Pirates of the Caribbean ride. As at the Blue Bayou in California's Disneyland, it’s a hoot to enjoy a meal as boatloads of passengers sail past. To those familiar with the typical Disneyland layout, the Shanghai park can be delightfully disorienting. Lots of things are missing such as the train and its railroad stations. With the absence of Big Thunder Mountain, Splash Mountain, and Space Mountain, the skyline is radically different. Other things are displaced, such as Dumbo and the carousel, which are located in front of the castle, and Tomorrowland, which is located to the left of the castle, instead of its usual spot on the right. Speaking of Tomorrowland, the sleek outpost is radically different from its counterparts at any of the other parks. Ditto Fantasyland. Instead of a compact, quaint village, it is a sprawling place arranged in a circle around a body of water. The entire park, in fact, is sprawling and filled with discovery. The Shanghai Disneyland Hotel may be the most upscale accommodations that Disney operates at any of its resorts. It’s so exclusive, the atmosphere seems almost too hushed and pristine—especially for a hotel at a theme park. But with its elegant Art Nouveau decor, it is a sight to behold. The Chinese people, apparently, place a premium on open, green space. 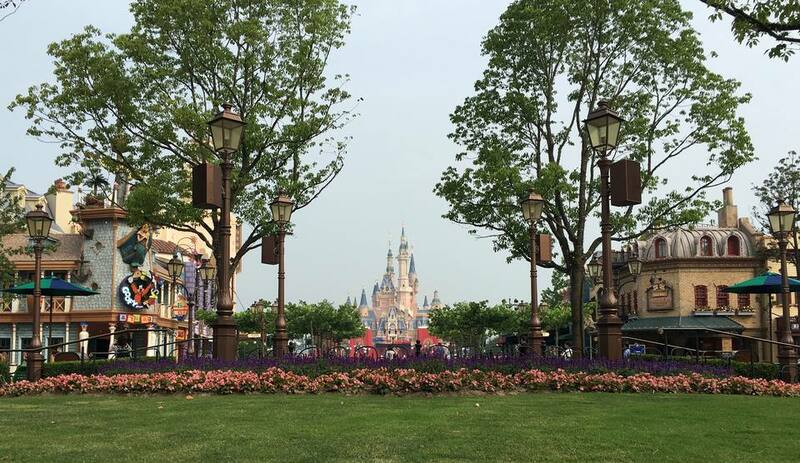 Shanghai Disney Resort accommodates them with plenty of lovely spots. Inside the park for example, the Gardens of Imagination offers lots of winding paths, flower beds, and benches. The huge tract of land, which resembles a well-manicured urban park, sits between the end of Mickey Avenue and the castle. Instead of the crowded, comparatively small central hub that occupies this spot at the other Disneylands, the Gardens of Imagination provides a bit of a refuge from the theme park bustle. Like many urban parks, it includes a carousel. Featuring horses created by Chinese artists, the ride has a Fantasia theme. Elsewhere in the park, there are shaded picnic areas. Outside the park, near the Shanghai Disneyland Hotel, the resort offers the free-admission Wishing Star Park. The huge area includes lush landscaping, walking paths, a lake, a children’s playground, and an amphitheater. “The level of detail is amazing,” Sklar added, and he cited the paving as a prime example. “People may not notice it, but it helps convey the story.” It is lovely—and it sure beats the black asphalt at some regional amusement parks. For the record, Sklar also expressed his admiration for Mickey Avenue (the entire land, not just the paving), noting that it conveys a sense of fun and whimsy and is a great way to set the tone at the entrance to the park. By the way, if English is your primary language (and if you are reading this article, chances are that is the case), Shanghai Disneyland— and the entire city of Shanghai for that matter—is surprisingly accommodating. Most of the signs are in English as well as Mandarin. While not every employee speaks perfect English, most have at least a passing fluency. Those who don’t generally seek the assistance of a colleague who could speak well. As in any foreign country, it behooves visitors to learn some key phrases in the native language.